In comparison, during the second quarter of 2009, the San Luis Obispo based bank reported a loss of $500,000. The bank’s second quarter losses came as it aggressively struggled to work through its problem loans and reduce its level of total non-performing assets, said Lawrence P. Ward, President and Chief Executive Officer in an earnings release. In early March, federal bank regulators took enforcement action against the bank, which operates 15 branches in San Luis Obispo and Santa Barbara counties, and banned the company from paying dividends or incurring debt as part of a written agreement between the company and the Federal Reserve Bank of San Francisco. On March 12, in order to increase its capital and strengthen its balance sheet, the bank raised proceeds of approximately $60 million through the sale of securities. ———————I too hope they can stay afloat! 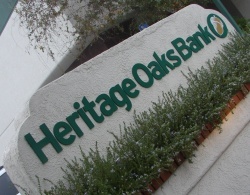 Heritage Oaks Bank to this day has still not answered the the questions that have been asked of them in regards to why they will not properly apply principal to my principal and interest loan with them since 2002! I hope they can stay afloat as there customer service has been outstanding at the branch level. Too bad we can’t just make it employee owned and operated. 12.5 million in charge offs. Wonder how much of that total is Hurst Fin./Gearhart and Estate Fin.? ?